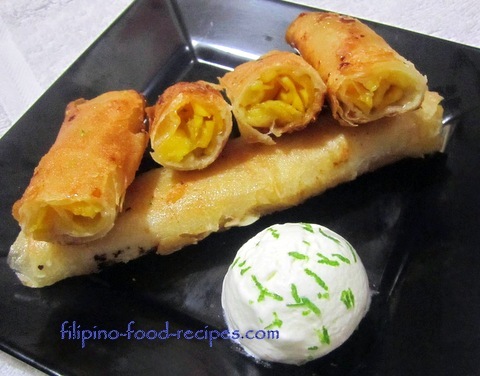 Mango Turon is my twist on the favorite Filipino dessert, Banana Turon or Sweet Banana springroll. Think Jollibee's Peach-mango pie -- it is somewhat similar to that, except that it's just ripe mango and in a crunchy spring roll instead of the flaky pie crust. I used apple mangoes (or more popularly referred to as Indian Mango in the Philippines) -- which are in abundance during the summer months. I came up with it when my son brought home a lot of mangoes from his vacation in Nueva Ecija. We started eating them when they were green, continued eating when they were getting ripe, but still there were more that would go bad if not consumed soon enough. So I thought it would be interesting to cook in sugar to keep it from getting too ripe(and inedible), roll in spring roll and fried as dessert. But, of course, the addition of the jack fruit gave it that familiar banana turon-like taste. 1 Dissolve the sugar in water, cook until a little caramelized. 2 Add in sliced mangoes and ripe langka and cook until the mangoes are soft. Set aside. 3 Roll in lumpia or springroll wrapper. 4 Fry and serve as it is or with ice cream. (Put with ice cream on top of each one when serving so the hot turon partly melts down the ice cream).